You are welcome to use a sample paragraph or short abstract of my article on your site or blog, but must then link back to the full article on this page for readers to follow. Enjoy, but do not use full article without permission from me! Contact. According to the old Finnish folk calendar, the year ended when the agricultural activities ceased. This was after the harvest and the autumn slaughter, sometime in October. Some ten to twelve days elapsed between the end of the old year and the start of the new. This period enabled the peasant calendar (which was calculated according to the moon phases) to catch up with the sun’s cycle. This meant that the event originally took place in autumn. 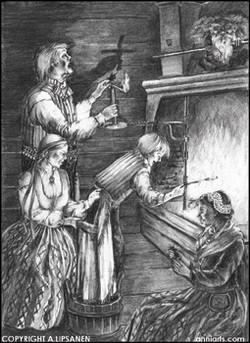 Leadpouring was a custom of west European origin that spread to Finland via Sweden. It took root in south–western Finland but was slow to spread to the eastern parts. The old folks sought to read future revelations in various rituals on New Year’s eve, but lead-pouring became the most popular. The main questions concerned marriage, death and material welfare. The whole family gathered around the oven at midnight on New Year’s Eve. A piece of lead was placed in a ladle and melted in the flames. Then the ladle was carefully removed while the onlookers said the name of the person for whom the lead was to be poured. It was usually the head of the family who took the first turn. He quickly poured the molten lead into a bucket filled with water, producing a sizzling sound and steam. The cooled and bizarrely formed piece of lead was retrieved by a younger family member and inspected by all. Ideally the lead had to have the shape of a recogniseable object – however vague. A verdict was then passed about its meaning. If one could discern the shape of a grain-bag, it promised a good harvest during the following year. Bulging bubbles on the surface of the lead held the promise of forthcoming money. A coffin obviously had connotations of death. When no clear conclusions could be drawn from the shape, shadow pictures were resorted to. The lead-shape was held in front of a candle-flame so that a shadow was produced on the wall. This silhouette was studied to determine the object it represented, and the meaning thereof discussed. A horse and cart meant a journey would be undertaken sometime in the future, and a ship would bring happiness. Unmarried girls searched for signs that indicated marriage, like rings or bridal crowns. The breaking up of the lead mass as it hit the water meant shattered luck and each person tried to avoid this. The whole procedure was repeated when the next piece of lead was poured for the mistress of the household. The sequence was repeated until each member of the family had had their turn and their future discussed. The last piece was poured for the resident troll or house spirit to establish his disposition towards the household. In Ostrobothnia however, it was generally the first piece of lead that was poured for the house troll. If there was enough lead each person kept his or her lead for the rest of the year. The water in the bucket was also believed to posess special properties. An unmarried girl could dip her scarf into it and sleep with the scarf under her pillow. She would then dream of who her groom was going to be. Leadpouring is still a favourite event in modern Finland. Special ladles and lead in the shape of little horse-shoes can be bought at market-stalls and in shops towards the year-end. Family and friends then gather at midnight on new year’s eve as the old folks used to do. I am the author of the original book which is no longer in print. However, it is in the process of being released again in a new format.